"Right now I’m pursuing a major in communications design and it’s all thanks to Louis, mainly." My love for digital art peaked when I was in the eighth grade. I had an iPhone and started randomly editing, modifying, and making a ton of collages (mainly of one direction). Around graduating that year, my mom gave me an iPad and, not gonna lie, I went ape-sh*t crazy on that thing. My main apps on it were always Leonardo, picsart, ps touch, superimpose, phonto, and other pre-photoshop apps. Around that same year, I acquired photoshop CS6 on my new laptop and that sparked more passion for me and editing. Right now I'm pursuing a major in communications design and it's all thanks to Louis, mainly. This one didn't get a whole lot of hype but I really like what I did here (see below). It was inspired by a mrpiper1980 and I aimed for the symmetrical style they do. It usually takes 20 minutes to two hours to finish one edit and up to two days if what I'm doing is time consuming. I do most of my work at home and if I have enough time I'll go to my uni's graphics lab. Both environments are fairly quiet so it's not hard to find peace wherever I'm editing. There has to be music playing. My highest recommendation right now is the Scott Pilgrim vs The World movie soundtrack. A majority of it is rock influenced and editing with it makes a fluid process. Also, it's best to start off with a blank canvas and create concepts from there. It helps me out at least. Conceptualizing is the hardest, but the best part. Making different, complicated concepts allows me to challenge what's unexpected and create a different experience while making it. Miss You as movie posters, Miss You as horror movie posters, Louis as Peaky Blinders and Dexter, these are concepts you don't expect, but somehow blends well when they're being put together. There's satisfaction in being able to do that. Right now I use (Adobe) Photoshop CS6 at home and Wacom Cintiq 22HD at school. Usually, I try to see if his expressions match the surroundings I'm putting him in. Take my Peaky Blinders edit for example. I couldn't take a low quality photo of him smiling, it wouldn't look right. I just need to be precise in picking the right photos and textures. 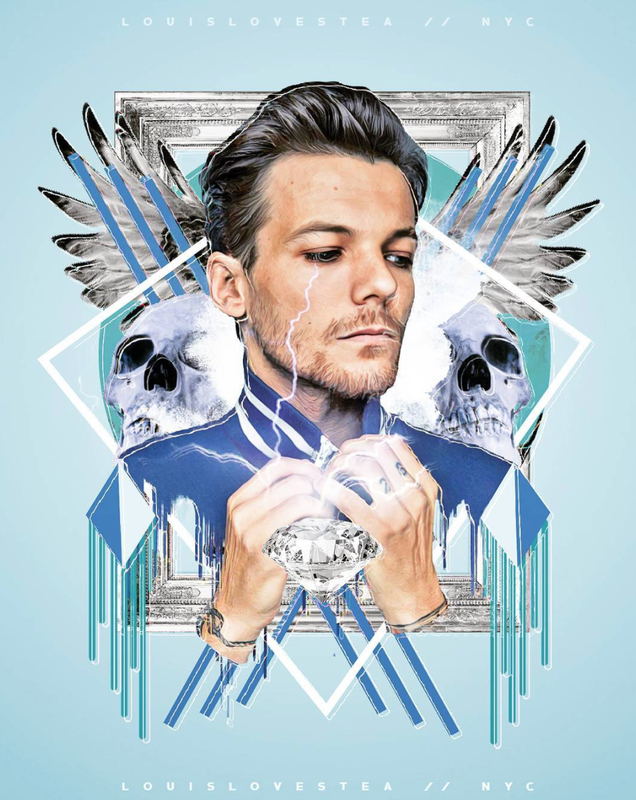 We'd like to thank louislovestea for sharing their amazing gift with the fandom and for taking the time to be part of our LOUIS IS ART series.